An album of songs that Cathy wrote with Meredith Ludwig for the musical “Gumbo Bottoms,” features Cathy, playing banjo and Indian flute, Dave Para on guitar, mandolin, jaw harp and bones, David Wilson and Tom Verdot on fiddle, Kevin Hennessy on bass, and a guest appearance on electric guitar by Pete Szkolka, who also recorded the project. 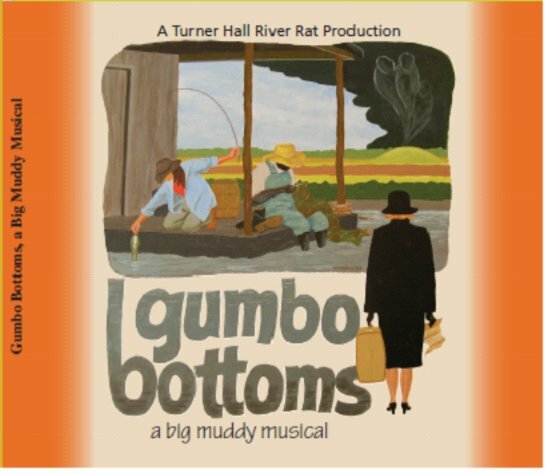 The musical, based on stories that Meredith collected from people who lived along the Missouri River, first appeared in a workshop production in 2006, was revised and premiered in 2008. The recording features cast members past and present: Lesley Oswald as Vivian Marks, Deb Jewett and Lou Thompson as Lucy Taylor, Steve Jones as Jacques Jeanrue, Willie Cogshell as Gabe and Josh Kluck as Gus. Misery(3:38) The year is 1928 and wealthy easterner, Vivian Marks, has just lost her husband and with him her fortune, except for a piece of bottomland in Missouri. Woman Needs a Man(2:00) Arriving in this “God-forsaken country”, Vivian, is approached by Jacques Jeanrue who thinks she’d be better off with his assistance. Wiley, Guiley, Mighty MO(2:50) Once shed of this faux Frenchman, Vivian presses Gabe Burns for a ride to her land where she meets Lucy Taylor and they explain the unpredictable nature of the river. Smell the Money(1:48) Learning the river has taken the property she intended to sell; Vivian reconsiders Jacque Jeanrue’s advances as he has promises to dig up treasure in the Indian mound on what’s left of her land. Cry of the Ancestors(4:14) Lucy tries to convince Vivian that only trouble will be found when the mound is disturbed. Vivian is unmoved, but her sleep is troubled. I’ll Take Perfume(2:50) Haunted by her dream of digging up her own Grand Mama, Vivian decides not to dig the mound and return to Boston. But Lucy intervenes and the two discuss the virtues of their chosen lifestyles. Nothing Better Than a River Life(2:30) Lucy offers Vivian a new home aboard her shanty boat. Unfree Freedom(3:50) As the water begins to rise, Gabe comes to retie the lines on the boat and Vivian accuses him of much more. Spring Rise(3:15) Lucy explains the threat of the flooding river. Mighty Big Catch(2:25) Vivian finds she’s been set adrift with only Gabe to help her. Once back on shore they round up Lucy and go after the culprits, Jacque Jeanrue and his accomplice, Gus. River’s Reach(4:12) Vivian spends the night on the shanty boat watching the river, unable to sleep. Gumbo Bottoms(2:12) Vivian finds her heart might just be stuck in gumbo clay.